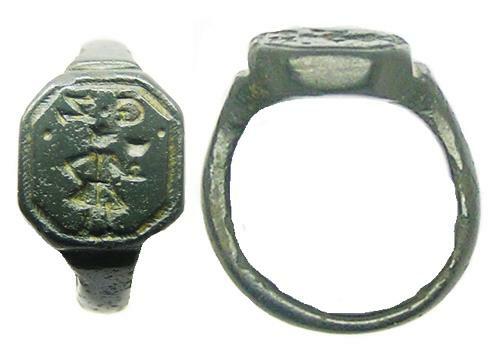 This is a rather charming Baroque signet ring, dating to the 17th century. The ring is quite a substantial piece, designed for active, everyday wear. Signets were used in business, for authenticating transactions and letters. The seal on this piece bears the owners initials G.Z. above a standing figure, bearing a chalice or silver wine cup. He wears a fashionable doublet and hat, his hand confidently on the hip. The pose is usually used by butlers or servants, presenting food and drink. The 'Z' may also stand for 'S' as in the spelling of Zilversmid & Silversmith. The ring is intact with a superb dark olive green patina, a nice piece that can still be worn today. DATE: c. 17th century A.D.